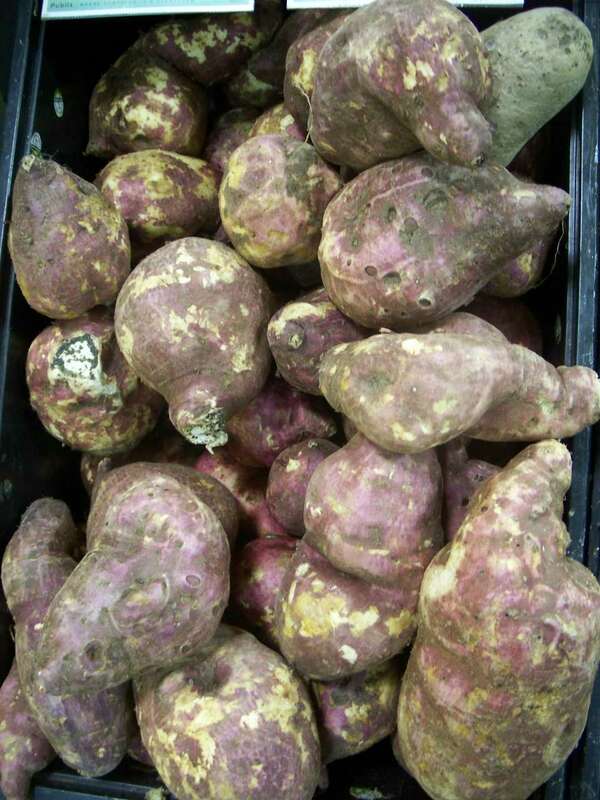 A boniato is a tuber — a sweet potato with dry, white flesh and pink to purple skin. If you think that this makes it a yam, you'd be wrong. Yams are in an entirely separate genus. Boniatos aren't as sweet as other sweet potatoes, but they're nonetheless one of the most popular potatoes in the Caribbean islands. They have a gentle, chestnut-like flavor. They're something of a cross between white potatoes and the sweet potatoes that are known in the U.S. The boniato is believed to predate Europeans arriving in the Caribbean islands — it's not one of those foods introduced by marauding explorers or imported African slaves, but rather it's native to the tropical areas of the Western Hemisphere. The name loosely derives from "harmless" in Spanish, a significant tag. Spanish explorers encountered many poisonous native foods and plants when they did arrive in the islands. Their name for these sweet potatoes set them apart as something that could be safely ingested. Boniatos are also known as batatas, Cuban sweet potatoes, white yams, Florida yams, camotes, kamotes or kamuras — but again, they're not yams. Boniatos are fragile, and they bruise easily, so they must be handled with care. Beyond that, this tuber can be used in just about any recipe that calls for sweet potatoes. It's often paired with pork, as well as with a variety of other vegetables including eggplant and arugula. You might find it served in the islands with goat cheese and raisins or both or used as an ingredient in soups, stews or even desserts. You might want to try it sprinkled on pizzas or tacos, and you can always mash boniatos like regular white potatoes with a little cream or milk and butter. Boniatos thrive all year, at least in the Caribbean. Florida also usually produces a bumper crop; this sweet potato is quite popular in Florida, but Asia currently lays claim to the greatest production of boniatos. It's said that the sweet potato was introduced there after being gathered by Eastern explorers and taken home. You might find it difficult to locate boniato in your neighborhood mega-market. They're mostly available in international markets that cater to Latin American and Asian populations. Look for tubers that are firm and without any soft spots. The ideal storage temperature for boniato is between 45 F and 50 F. The tuber's typical shelf life is up to 10 days if you keep it in a dry, cool place, but it will start losing flavor within a few days. This can be accelerated if you refrigerate it — better to simply tuck the potatoes in your pantry. Boniatos are a staple of the Caribbean diet not only because they're abundant in the islands, but because they also pack a nutritional wallop. They're rich in vitamins A and C, as well as potassium and a slew of antioxidants. They're high in fiber, which means they're filling — an indispensable advantage in times of famine throughout history. What Is Salt Cured Meat? What Is Winter Melon in Chinese Cooking?